The Goat Steep Assist allows you to get on and off of roofs and also the ability to move around safely. Climbing a steep roof could be a difficult and dangerous task. Whether you’re a plumber trying to clean the roof, or you’re just a dad trying to hang Christmas lights, a steep roof could easily make you lose interest in the task ahead. The conventional climbers just won’t do the job. If you have ever faced this dilemma, the GOAT Steep Assist is the solution you have been looking for. This genius device makes working on the top of your roof easy as pie. The name is drawn from the goat’s uncanny ability to maneuver the steepest hills, ascending or descending with admirable grace. This roof ladder essentially consists of a hook and three 6-foot poles. The interlocked poles provide the necessary height and the hook is used to attach the steep assist to the rooftop. Once the hook is securely attached, you can climb or get down your roof via the three handles that are attached to each pole. If your roof height is more than the average, you may go for the version with five 4-foot poles. No matter the version you opt for, you can be sure of a safe and efficient roof climbing experience. 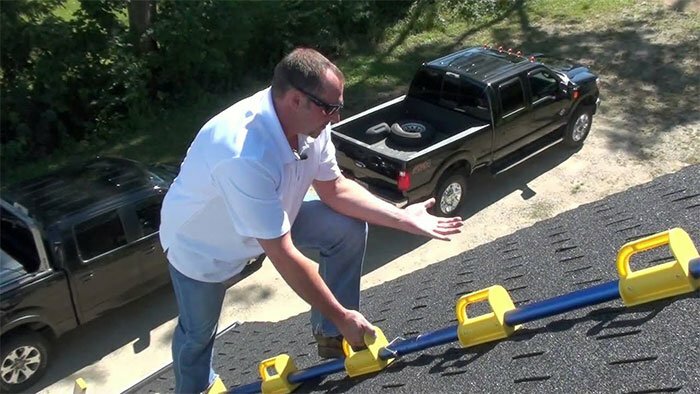 The GOAT steep assist is useful for any job that could prompt you to climb a steep roof. Slide the poles into each other in order to attach them linearly. You may use the first or second slot. Fasten both poles using the tap hook. Depending on the height of your roof, you may attach all three poles or just two. Fasten your ladder to the edge of your roof and adjust your body such that you are able to carry the steep assist. You may then begin climbing, making use of the handles that are attached to each pole. The GOAT Steep Assist is available on the company’s official website for $489. Accessories and replacement parts are also available on the website. According to the website, the orders are shipped on the same day but the arrival date of your order would depend on the shipping provider you choose.